Is Callum Hudson-Odoi ready for starting place at Chelsea? It’s an extremely rare sight to see Hector Bellerin, one of the fastest defenders in the world, getting beaten for pace and left on his back. 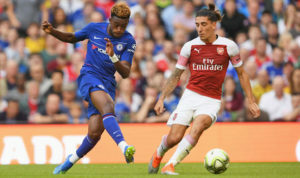 It was, however, something we saw on a regular basis on Wednesday night, when Arsenal took on Chelsea in the International Champions Cup in Dublin. Callum Hudson-Odoi, our 17 year-old starlet who has made his way up from the youth ranks, showed just why he is tipped to be a superstar in the future. When he was hauled off finally in the 85th minute, the whole of the Aviva Stadium rose in applause for a magnificent performance. Nearly every attack in the first half had gone through Hudson-Odoi, and the winger could have had at least a hattrick of assists had Alvaro Morata’s finishing not been dismal. He got in behind at will, ran at Bellerin with supreme confidence and put his strike partner through on multiple occasions with smart through-balls. He won a penalty with a brilliant faked disguise, only for Morata to see his spot-kick saved by Petr Cech. Yes, his decision-making at times was a bit rusty, but that is to be expected from someone his age. After the match, which we lost on penalties after conceding a last-minute equaliser, Maurizio Sarri confirmed that Hudson-Odoi would not be sent on loan this season. He clearly fits the bill when it comes to what the attacker asks for from his strikers. He is quick, skillful, and has an eye for both a pass and a goal. Hudson-Odoi will almost certainly start for Chelsea in the Community Shield against Manchester City on Sunday. Eden Hazard and Willian are yet to return following their World Cup assignments, even though the latter was expected back last Friday. Sarri expressed his displeasure at Willian’s absence, and said that he would speak to the player to know the reason for his lateness. Either way, this is a huge chance for Hudson-Odoi to shine and prove his worth. Willian may have been one of the Chelsea’s most important players from the past couple of seasons, but he still doesn’t produce nearly as many goals and assists as one would want. Last year was his best goalscoring campaign, as he found the back of the net 13 times in all competitions. For a player who plays in such an advanced on a regular basis, one wouldn’t be wrong to expect more. Hudson-Odoi simply has to make the most of his opportunities in the next couple of weeks. If he can put in another impressive showing on Sunday, he will also be in line for a start in the opening Premier League game against Huddersfield Town on August 11. The hype may be a bit premature based on a couple of pre-season games, but this has well and truly been a long time coming. Hudson-Odoi played starring in the last two FA Youth Cup victories, scoring twice in the final last year. He has also made 22 appearances at the England under-17 level. If given the right amount of game time and confidence, this could very well be his breakout season as a senior professional. There is, of course, competition from Hazard, Willian and Pedro, but if he can get in Sarri’s good books and show returns, age and inexperience are no reasons to keep him out of the team on merit. One of the common criticisms that Sarri received during his time at Napoli was that he didn’t use youngsters coming out of the club’s system enough. But it could also be that there weren’t individuals with the talent possessed by the likes of Hudson-Odoi, Ruben Loftus-Cheek and Ethan Ampadu, all of whom have heavily featured in pre-season. Whether this translates to game time in the season proper remains to be seen.